2) Tell us which GMP you use, and how many persons, places, sources, etc. are in your database(s) today in a blog post of your own, in a comment to this blog post, or in a Facebook status or Google+ stream comment. * Ancestry Member Tree: Select your tree, then click on "Tree Pages," and select "Tree Overview." * MyHeritage Tree: Click on "Go to Family Stats" on your home page. While I use each of these programs, the only program file that is "up-to-date" is my RootsMagic 7 database. I am in the 8th great-grandmothers and I'm up to Ancestor #1427, who is Elizabeth STOKES (1639-1704) [Note: the earlier great-grandmothers and 8th great-grandfathers have been covered in earlier posts]. 1426. Nathaniel Potter, born 1637 in Portsmouth, Newport, Rhode Island, United States; died 20 October 1704 in Dartmouth, Bristol, Massachusetts, United States. He was the son of 2852. Nathaniel Potter and 2853. Dorothy. He married about 1664 in Portsmouth, Newport, Rhode Island, United States. 1427. Elizabeth Stokes, born about 1639 in Portsmouth, Newport, Rhode Island, United States; died after 20 November 1704 in probably Dartmouth, Bristol, Massachusetts, United States. * Stokes Potter (1664-1718), married 1702 Elizabeth Sherman (1670-1718). * John Potter (1666-1769), married 1688 Mary Tripp (1670-????). * William Potter (1671-1720), married 1706 Anne Durfee (1676-1731). * Benjamin Potter (1673-1709), married 1697 Mary (1677-????). * Mary Potter (1675-1752), married 1689 Samuel Wilbur (1664-1740). * Samuel Potter (1675-q748), married 1701 Mary Benton (1681-????). * Ichabod Potter (1677-1755), married (1) 1699 Margaret Helme (1679-1727); (2) 1727 Eleanor Capron (1677-1755). * Elizabeth Potter (1683-17134), married 1707 Benjamin Tripp (1678-1754). * Katherine Potter (1683-1763), marred 1716 Thomas Cornell (1685-1763). * Alden G. Beaman, Ph.D. "A Line of Descent from Nathaniel Potter of Portsmouth,"Rhode Island Genealogical Register, Volume 20, Number 1 (1999), pages 35-38. I have found no helpful books or periodical articles that define Elizabeth Stokes parents. There are several possible Stokes families in online family trees, but most of them are without source citations. * Making Progress on My Auble Cousins - Post 1: Finding Elizabeth's Will (25 April 2016). In this series of posts, I am discussing the challenges that I found identifying the heirs of Elizabeth Auble who were named in her 1893 will. * Cora Struble -- relationship to Elizabeth not stated, wife of Edward Struble of Newton. She was bequeathed $300. I had no knowledge of Cora or Edward Struble before reading Elizabeth's will. * David Struble -- relationship to Elizabeth not stated, but probably related to Edward and Cora Struble. He was bequeathed $300. I had no knowledge of David Struble before reading Elizabeth's will. * Cora J. Struble - wife, female, white, born May 1864, age 36, married, for 15 years, 4 children born, 4 living, born New Jersey, father born New Jersey, mother born New Jersey, no occupation. * George A. Struble - son, male, white, born Feby 1887, age 13, single, born New Jersey, father born New Jersey, mother born New Jersey, at school. * David A. Struble - son, male, white, born Sep 1893, age 6, single, born New Jersey, father born New Jersey, mother born New Jersey, , at school. * Minnie F. Wilson - boarder, female, white, born Jany 1873, age 27, single, born New Jersey, father born New Jersey, mother born New Jersey, , no occupation. 1900 United States Federal Census, Sussex County, New Jersey, population schedule, Newton, ED 171, page 4A, dwelling #78, family #80, Edward Struble household; digital image, Ancestry.com (http://www.ancestry.com); original record on National Archives Microfilm Publication T623, Roll 995. 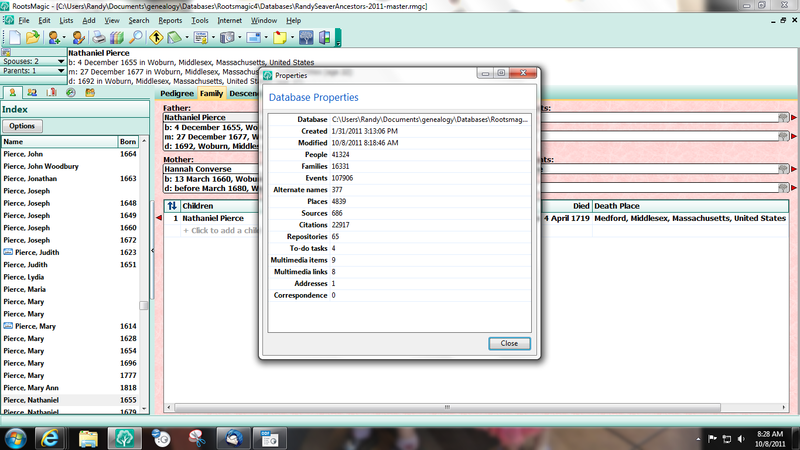 There are other census records after 1900 for Cora and the children, but not for Edward. There are Ancestry Member Trees with this family in them; they list Edward's parents as Richard Struble (1820-1890) and Elizabeth Beemer (1820-1915). Edward was born 22 September 1859, and died 14 June 1907 in Newton, N.J. The memorial gives her name as Cora J. Wilson Struble, born 22 May 1865 and died 28 March 1938. No parents are provided. So Cora may be a Wilson - remember that Minnie F. Wilson was enumerated in the 1900 U.S. Census with this family. Was shr a sister? I found no parents names for Cora Wilson in the Ancestry Member Trees, nor in a search in all of Ancestry's records. I looked in the "New Jersey Death and Burials Index, 1771-1971)" on Ancestry.com for a record of the death of Cora (Wilson) Struble, in hopes that it would provide her parents' names, but I found no matches using her names, birth year and death year. This record provides his full name (David Auble Struble), birth date (1 September 1893) and birth place (Newton, N.J.). That matches the birth record above. The same information is in his World War II Draft Registration record. David Struble appears in the 1910 through 1940 U.S. Census records and the Social Security Death Index, dying in 1985. According to available records, he was the father of three sons, including another David Auble Struble (1924-1981). 5) I added all of these Struble persons to my RootsMagic database, and then synced them to existing persons in the FamilySearch Family Tree. Several of the Struble children were not in the Family Tree, so I added them. The Family Tree had no parents for Cora Wilson. Neither did Geni.com or MyHeritage trees. 6) That's as far as I've gotten with this family. The middle name of David Auble Struble leads me to believe that the Strubles may be related to the Aubles. The parents of Edward Struble are known and are contemporaries of Elizabeth Auble and her siblings residing in Sussex County, New Jersey, so it's probably not the Struble family. Cora's birth is too late to be a child of Sophia Auble or Sarah Auble. It is possible that Cora Wilson is a child of a sibling of Elizabeth Auble. There may still be another unknown female sibling of Elizabeth, Sophia, Sarah, David, Williams, Nathan, Hampton and Robert Auble. It may be that Elizabeth Auble's will named Cora Struble because she was a friend or neighbor of Elizabeth Auble, or of her parents, or one of her sisters or brothers.